Choosing the perfect lens for your situation can be difficult. So we narrowed down the 6 best macro lenses for Nikons to help you make your choice. To start, it may be helpful to identify what exactly qualifies a lens as macro. While many people mistakenly interchange macro with close-up, the two are not the same. Macro images are typically shot at a short distance from the subject matter. However, the magnification is actually what makes the image macro. For a lens to be considered macro, it has to have life-sized magnification (1:1) or larger. These lenses are typically used when photographing things in nature, such as flowers and insects. They are also commonly used to capture architectural details. Many photographers like to have this lens in their kit to experiment. That makes shorter lenses that are lightweight and less expensive appealing. If you plan on using this lens for your professional work, however, there are longer lenses that cost significantly more but will give you a better image in the end. Here are some of the considerations we looked at when narrowing down our 6 favorite macro lenses for Nikon Cameras. There are a number of excellent macro lenses available. They all help you achieve high quality images. However, narrowing down which exact lens is best for your needs can be challenging. While a 50mm lens and a 100mm lens can both provide 1:1 images of a subject, the 50 mm can do it at a closer range. Depending on your needs though, this could either be a good thing or a bad thing. It can get even more confusing when “zoom macro lenses” start popping up in your searches. In this section, we will outline a number of criteria to consider when searching for the right macro lens for you. That includes zoom or fixed and subject type. It also includes whether you plan to have multiple macro lenses or just one. This question is relatively easy to answer. There is currently no such thing as a true zoom macro lens. Technically speaking, a macro lens captures subjects at 1:1 magnification or higher. That is life-sized or larger. At best, a zoom lens will likely get you to one third life-sized in your final image. With that being said, you may prefer zoom lens that gets you close but isn’t quite life-sized. It depends on your subject matter and how you plan on using the images you want to take. Such zoom lenses are more versatile than macro lenses. If you aren’t planning on doing work that specifically requires a macro lens and you can only afford to have one or two lenses in your budget DSLR kit, this may be a better option for you. The short lenses tend to cost less and be very lightweight. However, they have shorter working distances. That makes them bad for subjects that move. This can be a great option if you are looking to purchase a macro lens to test it out and see if you want to purchase a more robust one to have in your kit. Mid-range lenses have a larger working distance while still being relatively inexpensive. They are perfect if you want to photograph flowers. They allow you to get close enough that other items in the background or foreground aren’t in focus without having to be so close that you are nearly touching your subject. These lenses tend to give the best technology at the lowest price point. Finally, long macro lenses have the most impressive working distance and image quality. However, they can be prohibitively expensive and heavy. They are the best option if you want to photograph insects and other subjects that move. They can handle the movement and stay in focus the best. However, they do tend to cost over $1,000. So make sure that this is the right path before you make your purchase. Subject matter can go a long way towards helping narrow down the specific type of macro lens you need. That is because different focal lengths are better for different objects. If your main concern is how your subject relates to the background, you need a lens that is wider. That would be a 50 mm lens. This will allow you to capture more detail in the background than a narrower lens like a 100 mm will. If you’re photographing subjects that are trickier or move a lot however, like insects, you’ll want to pay a little more for longer macro lenses. This will help ensure that most of your photos have a better chance of being sharply in focus. If you plan on photographing flowers and plants or other subjects that are mostly stationary, a short or mid-range lens is fine. Issues with lighting come up frequently in macro photography. The most common problem is photographers blocking their own light. Lenses that allow you to get up close when photographing are great. However, they definitely increase the chance that you will capture your own shadow when photographing. You can solve this issue by introducing your own light. Or, if you are using natural and available light, try to stand as far away from your subject as possible. Light is always important. However, you likely aren’t used to having to monitor your own shadow to this extent. Paying extra close attention when you are photographing and checking your images as you go can also help you avoid this issue. Cost – When does cost correlate with low quality, and how do you know it is not a rip-off? Value – We love getting the most bang for your buck and try to select lenses that have high quality technology for a reasonable price. Focal Length/working distance/depth of field – How close do you need to be to your subject and how much detail does it capture in the background? Vibration Reduction – How stable is the lens and is blur an issue in the final images? While the list of things to consider can be endless, here is a breakdown of the top criteria we used when creating this list. We all wish we were made of money. However, cost has to factor in when purchasing such a specific lens. Macro lenses range from $200 to $2,000. So it can be particularly challenging to ascertain if you are purchasing a lens that is high quality, good value and not too expensive for what it’s worth. Short-range lenses are best for casual, general purpose macro photography. They generally cost between $200 and $400. You’ll want to focus here if you want a macro lens for casual experimentation. (But not professional work.) We’ve included several in this category that are a good value given their low price point. Mid-length lenses are great for photographers who are more serious about macro photography. They are good for people who want high-quality images for less than the price of the long lenses. These can be used for either causal or professional cameras. Generally, they cost between $700 and $900. While these are considerably more expensive than short-range lenses, they tend to be a better value. Finally, long macro lenses are great for shooting moving subjects, like insects. They produce the highest-quality images. These are generally best for professional photographers who shoot macro images as part of their work. These cost between $1,000 and $2,000. With all of these costs broken down, the next step for you to consider is what you want to use your macro lens for. This question alone may help you determine which category you fall into. It is important to start by defining what this means in terms of macro lenses. That is because he way this term is handled tends to differ from other lenses. Unlike with typical photography, magnification is the most important, defining consideration when it comes to macro. Focal length is defined as the distance between the image plane and the optical center of the lens. You may thing that a longer focal length means a telephoto macro lens. However, this is not always the case. Macro lenses of all different focal lengths can have the same 1:1 life-sized magnification ratio. The minimal focal distance is really what determines whether you are using a normal lens, a wide-angle macro lens or a telephoto macro lens. A longer focal length has a larger working distance. That ultimately allows you to stand farther away from the object you are photographing. Longer focal length lenses help you achieve a shallower depth of field. They also help you eliminate lighting issues. However, lenses with shorter focal lengths are smaller, lighter, and less expensive. They achieve the same magnification. Generally, it is important to determine what you plan to photograph. You will also need to determine how seriously you want to use your macro lens. It is important to do that before you choose a specific focal length to focus on during your search. Vibration reduction, or image stabilization if you’re more familiar with Canon, is essential in buying a macro lens. Really, it’s important in any lens. That is because Nikon doesn’t tend to build it into their DSLR camera bodies. This arose because in-camera stabilization was prohibitively expensive in the past when 35mm film cameras were king. That made it necessary to build it into the lens. This isn’t always the case now. Sony and Pentax prefer body stabilization. However, Nikon and Canon still stick to lens stabilization. What does this mean for you? Basically, depending on the focal length, lenses without image stabilization can be pretty useless. That is, if you aren’t planning on using a travel tripod and a remote trigger release. Vibration reduction is most important in longer lenses. That is because bigger sensor movements make the lens more sensitive to small movements while you are taking a photo. Even clicking the shutter button or a slight shake in your hands can make capturing a crisp image impossible. My zoom lens has a “macro” setting. Do I really need a macro lens for macro photography? Macro lenses, by definition, have a magnification ratio of 1:1 or closer. Therefore, a majority of true macro lenses are prime, or have a fixed focal length. Some zoom lenses, like the Nikon 70 – 180, will give you similar photos. However, it is not a true macro lens. You need a macro lens to achieve true macro, sharp, well contrasted, minimal distortion images. What is working distance, and how does it relate to focal length? Focal length is the distance between the image plane and the optical center of the lens. However, working distance is the distance between the filter ring on the lens front and the subject you are photographing. This is different than the focal length for most lenses. That is the distance from the digital sensor or film to the subject, not the front of the lens. Working distance is particularly important in terms of light. That is because it is easier to block light if you are standing very close to your subject, and live subject matter like butterflies and other insects. A short working distance that requires you to get so close to a subject that you are almost touching it makes photographing insects almost impossible. That is because you will scare them away nine times out of ten. Why is it harder to get sharply focused images when shooting macro Photography? Many photographers have a harder time getting perfectly focused images using macro lenses than other lenses. There are a number of reasons why this is the case. When shooting at these distances, camera shake has a significantly worse effect on the final image than at longer distances. Because you are so close to your subject, a small move shifts what is in your viewfinder far more than if you are shooting something further away. You can see this effect if you hold your hand at arm’s length and move it slightly and repeat the same movement right in front of your eyes. The same effect can happen even if you have your camera mounted on a photo or video tripod if the subject you are photographing moves at all. This is a common problem when photographing flowers or other plants. Breezes and animals can cause them to sway slightly, making it difficult to get a sharp image. Your shutter speed may also be too slow for the conditions you are shooting in. Macro lenses focus very close up. So you may also simply be focusing on the wrong area of your subject. Try to ascertain if any area of your photo is sharply in focus. That will help you to see if this is what happened to your photos before making adjustments. Mount your camera on a tripod to reduce camera shake. Shield your subject from wind as much as possible using your free hand or reflector or something similar. Make sure your shield isn’t also blocking your light though. If you can’t decrease your aperture to increase your shutter speed, boost the ISO setting in your camera or add more light using a reflector, a fixed light or a flash. How do I choose between different lens manufacturers? There are many macro lenses that will work with Nikon camera bodies. They include Nikkor lenses from Nikon and third-party manufacturers like Sigma, Tamron and Tokina. While Nikkor lenses are most often built the best, third-party options are also very reliable. Here are some of the most important factors to consider between the different options. There are even more manufacturers that create manual focus lenses that are compatible with Nikon DSLR camera bodies than autofocus lenses. They are all of pretty reliable quality. If you are only planning on using your lens for macro work, autofocus isn’t likely to be useful anyway. So consider manual focus lenses in your search as well. If you are going to try to use the lens for landscape or portraiture though, you may want to narrow your search to lenses that have autofocus and vibration reduction. Also, if you own a consumer grade Nikon, which includes D40 through D100, manual focus lenses are only compatible if you set metering to manual. All this means is that you’ll need to purchase and be comfortable with using a hand-held light meter. Nikkor lenses will almost always cost more than third-party lenses. However, they also tend to be the highest quality. You will likely only notice these differences if you are shooting professionally, however. So once again how you plan on using your camera is the most important consideration. The easiest answer to this is, it depends. Many photographers shoot macro photography handheld with a point & shoot. However, this can be difficult if you have a long lens that is heavy. It can also be difficult if you need to use reflectors, a hand-held light meter or other hand-held equipment in creating your final image. Tripods can help you get your camera closer to your subject matter without standing in your light. They can also allow you to shoot at a slower shutter speed if you don’t want to have to add flash and other light in lower-light situations. Basically, you can either shoot macro photography hand-held or with a tripod. Whichever you choose though, it’s probably good to have a tripod on hand in case you can’t complete a shot and you need to switch up your technique. Which focal length is better for studio work? Long length macro lenses are generally preferred for work done outside, such as photographing insects and other animals that would be spooked by a shorter-length lens. However, shorter lenses are preferred for working in a studio. Not only do you have more control over your environment when it comes to light and breezes that cause movement, but you also likely have less distance to work with if you need to be further from a subject to focus your image. Longer lenses are also great for getting a shallower depth of field. However, you don’t need to consider this if you are shooting against a plain backdrop like a studio wall or screen. What is the difference between Micro and Macro? Macro literally means big, while micro means small, the two are actually used interchangeably in photography. The interchangeable terms came about because both apply to the photography of small things: Macro photography is used to make small (micro) subjects appear large (macro). In addition to making their zoom rings opposite and several other confusing opposites, Canon has “macro lenses” while Nikon has “micro lenses,” even though they are the same thing. Bokeh is a Japanese word that describes the out-of-focus area of a photograph. This forces us to focus on a certain area of the image. It can create a pleasant, soft, clean background where there would otherwise be messy chaos. This is particularly sought after with macro photography. That is because there is such a high level of detail in the main subject that sharp or even hazy details in the background can be distracting. Bokeh often creates soft balls of lights and swirling colors. It is particularly popular among Instagram users. There are a number of apps that you can purchase that add hazy shapes to the edges of images. We have selected the following six lenses based on several factors. Those include minimal focus length, aperture length, whether they have vibration reduction and autofocus or not, their weight and their ideal subject matter. We have also considered what reviewers tend to praise or criticize about each lens. Pros: This mid-length macro lens produces sharp, high quality images. It can focus from infinity to 1:1 magnification, and has vibration reduction built in. Cons: The lens is expensive and gives strong vignetting in the final images. It is also made of plastic with a coating that can scratch easily. What Makes this Lens Special? The mid-range focal length macro lenses are particularly versatile. They allow photographers to take sharp, macro images or use the same lens for landscape or portraiture. 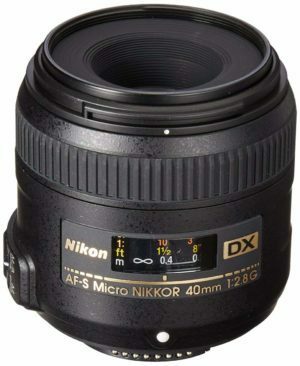 This lens is a great starter lens for professionals and photography enthusiasts. It is long enough to allow you to begin photographing wildlife and insects. It gives incredibly high-quality photos for less than the cost of a long-focal length macro lens. This is the first macro lens from Sigma to contain optical stabilization and their Hyper-sonic Motor. That allows the lens to focus silently by using interior elements to focus. The image stabilization also has two modes. Those are typical blur reduction and one that prevents vertical shake while photographing subjects that are moving horizontally in relation to the camera. The lens is built well. It comes with two plastic lens hoods for cropped sensor cameras and full-frame cameras. The body of the lens is also plastic. However, it is high-quality and doesn’t feel cheap. Images are almost always sharp. People often report that they are sharper than many similar Nikkor lenses at the same focal length. Also, in comparison to other lenses at a similar focal length, this lens is relatively affordable. It may not be the best choice for casual photographers who want something inexpensive to play with. However, it is a great option for photographers with more experience. 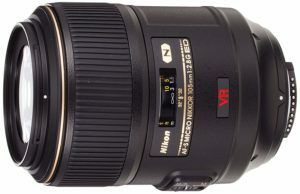 A majority of reviewers loved this lens. They found it to be one of the most versatile macro lenses available for a reasonable price. Images they took using it were almost always sharp. People often reviewed it as better than Nikkor lenses and lenses from other manufacturers at the same focal length. It performs particularly well for portraiture. It comes with several extras that make this lens a great value. Those include a carrying case and lens hoods. One of the biggest comments is that, because the lens is plastic with a coating, the coating can easily scratch off. That results in unsightly shiny patches. There is also quite a bit of vignetting, but this is easily corrected in post processing. The lens does come with a 62 mm thread for filters. While these filters are cheaper than 67mm, 77mm or 82mm filters, the manufacturer recommends using no more than two filters due to the vignetting. Overall, reviewers found this lens to be a great value for the price and rated it as reliable and high-performing. While the autofocus system is high tech and silent, relying on internal components to focus the lens, the optical stabilization does make the lens quite noisy. This can be problematic if you are photographing live subjects, as the lens allows you to be a decent distance away, but the noise may still startle them. While the switches for AF-MF and the OS modes are conveniently located on the lens, they are tightly built and stiff, making them hard to operate. Due to the coating on the plastic shell of the lens, you’ll want to make sure you have a soft cloth lens bag or a segregated pocket in your camera bag to store the lens to prevent scratches. The lens also feels particularly delicate given the internal focus elements, which is not altogether unlike other macro lenses but can be surprising to photographers who are not used to this. Pros: This lens is one of the least expensive from Nikkor, has Silent Wave Motor/AF-S, Super Integrated Coating, and is super lightweight. Cons: There is no image stabilization and it is easy to block light given the extremely short focal length. This is one of the best macro lenses available for photographers who want to be able to use macro technology without breaking the bank. While the lens is only for cameras with a DX sensor, like Nikon’s D3100, D5100 and D700, it costs less than $300 and includes many top-of-the-line features. The lens comes equipped with Nikon’s Silent Wave Motor for autofocusing, which enables the lens to autofocus silently. This is invaluable when photographing live subjects, as the noise can startle them. The lens also has Super Integrated Coating on the glass, which significantly cuts down on lens flare and ghosting. The lens itself is small and compact, weighing just 280 grams, or 10 ounces. This makes it just 4 ounces heavier than some of Nikon’s super lightweight lens models. It also has a 1:1 ratio when photographing subjects, 0.53 ft minimum focus distance from the sensor, a focus limiter switch that can increase autofocus speeds and 7 semi-rounded diaphragm blades that create significant bokeh effects. The lens also comes equipped with Nikon’s Close-Range Correction system, which enables each lens group to move on its own. This allows photographers to get better performance from this lens at closer distances from their subjects. The lens barrel extends significantly due to the short barrel length when you are using this lens for macro photography, meaning there is a decent chance you will block a significant amount of your light. While this is a challenge, you can overcome it by using reflectors, stand lights, flashes or simply paying attention to your positioning relative to the sun if you are outside of light source if you are inside. Because this is a lower-cost alternative to more expensive full-frame macro lenses, the manufacturer designed this lens specifically for macro and Nikon portrait photography. While it is excellent for photographing food, flowers and other macro subjects, it is mediocre in photographing smaller objects than these. If you want to photograph really tiny objects, you would be better off purchasing a lens with a longer minimum focal length. The lens has a solid build, with a metal mount and a plastic body. The plastic feels a little cheap, but the lens itself is cheap, so that’s not an issue. There is also a rubber gasket the helps seal the lens against the DSLR to prevent dust from getting into your set up. While the Silent Wave Motor’s ability to silently autofocus is invaluable, the 40 mm minimum focus length may make it difficult to photograph live subjects since you will have to get incredibly close to them to focus your lens. Given that macro lenses are able to focus at infinity and very close to subjects, the autofocus system moves in very small increments, very slowly. This makes this lens quite slow if you are trying to shift between macro photography and landscape for instance, and you may miss your shot if you are trying to capture something that can move, like a butterfly or a bird. The camera does come with a manual focus option however, which you may prefer to use to correct this issue. Cons: This lens is a little on the heavy side and is more expensive than other options. Nikon’s flagship macro lens was the first macro lens from any manufacturer to include image stabilization and is compatible with cropped-frame DX-format cameras and full-frame bodies. It is the second longest and second most-expensive lens from Nikon and comes equipped with a lot of their top technology. Given this and the fact that it is a mild telephoto lens, it is particularly popular among wedding and portrait photographers. While the lens is bulky and long, the image stabilization prevents camera shake from being an issue. It is also equipped with 62 mm filter thread, meaning you can purchase and use less expensive filters. The autofocus uses Nikon’s Silent Wave Motor technology, making it completely silent when you are using autofocus. The lens also comes with a flexible lens pouch, a lens cap that snaps on to the front and a bayonet lens hood. It is also weatherproofed and comes with a rubber grommet on the lens-mount to prevent moisture or dust from getting into your camera body. While this lens isn’t ideal for general walking-around photography or travel cameras, it is more versatile than expected. It takes excellent macro photos and allows you to get further from your subject than short-length lenses like the 40 mm Nikkor lens reviewed above and is also ideal for portraiture or landscape photography. It also comes with 9 rounded blades to create a pleasant bokeh effect, and has a minimum focus distance of 1 foot, which is far enough away that you can begin photographing insects. Many living subjects will still spook at this distance, so if this is your main purpose you should purchase a longer-distance lens. Overall reviewers found this lens to be reliable, high quality and a good value. It is certainly more expensive than lenses like the 40 mm Nikkor, but it is also higher performing and a great option for professional photographers. This lens is moderately heavy at 1.6 pounds but weighs considerably less than many other Nikon telephoto macro lenses. This makes it possible to use this set up without a tripod, though your arms might tire if you are doing a longer photoshoot. It is also considerably more expensive than shorter lenses, meaning you will want to be intentional about your use if you plan on purchasing this lens. Pros: This is one of the only lenses at this focal length to have vibration reduction, and it yields consistently high quality, sharp images. It is also a reasonable price for the focal length. Cons: The lens only has a moderately wide-aperture and delivers photos that aren’t as sharp as other Nikkor or Sigma lenses. This lens is an excellent choice for macro photography and is made for superior performance (SP) with either film SLR or DSLR camera bodies (Di). It comes with an autofocus motor that uses Tamron’s Ultrasonic Drive technology, has image stabilization, and has 9 rounded blades in the lens to create a pleasant Bokeh effect. Images come out sharp from corner to corner at f/28 and are razor sharp at an aperture of f/4 or more, making this a great option for photography enthusiasts and professionals alike. While Tamron also just released an 85 mm lens with similar specs, the 90 mm lens has a narrower minimum aperture of f/2.8 vs. f/4, making it unique in its class. Even though the autofocus is completely silent, the image stabilization makes a slight clicking nose when the camera turns on or shuts off. There is also a faint humming sounds while you operate the camera with vibration reduction on, which may startle live subjects when you are photographing them at a close distance. This lens handles light flares better than most macro lenses and does particularly well when compared with other telephoto lens. It even performs well in this regard with the sun placed in the corner of the frame at f/16. There are also no concerns when it comes to distortion with the Tamron 90, as this lens has less linear distortion than normal for lenses at this focal length at all aperture stops. While Tamron offers lenses that are often known for being lower quality than other makers, the Tamron 90 VC lens is a step above and offers consistent, excellent quality images. It is one of the few lenses with a metal shell, which makes it feel solid. There is also a switch that is very handy that helps you narrow the focus distance to 0.3 – 0.5, 0.5 – infinity or full, which helps ensure that the lens operates quickly and efficiently. The vibration control on this lens is a big selling point, as the similar lens from Nikon doesn’t come with this feature. This makes the Tamron lens a more reliable option for shooting in low light. This lens also controls chromatic aberrations, or purple and blue fringes on the contrasted edges within the photo, particularly well compared to other macro lenses. The bokeh effects on this lens are smoother than other options, with the 9-blade diaphragm creating 18-point stars in the out-of-focus background. This enables photographers to create macro images with the focus being specifically directed. The Tamron lens isn’t the sharpest, fastest lens at its focal length, which it makes up for in its more reasonable than normal price point. The 90 VC lens is also compatible with Tamron’s extension tube, which allows an even shorter focus distance. The lens itself has a matte metal finish, which gives the lens a professional, clean appearance. It is the second lightest lens at this focal length, with the Tokina 100m weighing .3 ounces less, and the other Sigma, Nikkor and Zeiss lenses weighing between 25 ounces and 30 ounces. Also, while the 62 mm filters are smaller and lower cost, they are less common, and most photographers don’t already have them in their kits. The Tamron 90 VC also does not come with a lens cap included, but you can store the lens with the mount cap connected to protect the weather sealing gasket at the back of the lens. As with most third-party manufacturers, Tamron reverse manufactures algorithms that are compatible with Nikon, meaning there is always a slight possibility that your camera will not be compatible with your lens if your camera body is an older model. This is such a slight possibility however that it is barely worth mentioning, particularly if you order the lens from Amazon or another website where it is easily returnable. Pros: This lens has a fast autofocus with a silent motor, smooth manual focus, and delivers images that are sharp with vignetting. Cons: This lens struggles with chromatic aberration more than others and is certainly more expensive than lenses with a shorter minimum focal length. 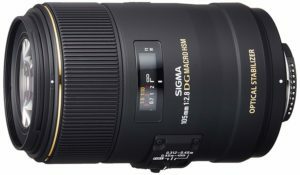 Sigma’s goal in creating this lens was to create the first 180mm macro lens with an aperture as wide as f/2.8. 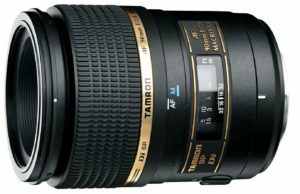 While Tamron makes a lens that is 180 mm, it only opens to f/3.5, making Sigma’s lens unique at the moment. At 3.6 pounds, it is the heaviest lens on this list, but that also gives it a hefty, quality feeling. Since it is a telephoto lens, it comes with an optional tripod collar that enables you to place the lens on a tripod without hooking up your entire camera body. It also puts a line on the lens and the collar that enables you to level your horizon easily if you switch quickly between landscape and portrait orientation, which some other lenses lack. It also delivers consistent sharpness from f/2.8 through f/22, with images coming out particularly sharp between f/7.1 and f/9. The autofocus was sharper than normal though, and rarely needed to focus all the way in then back out. The lens is able to hover around the focus point and make small adjustments to focus, which is handy in reducing the time needed for photoshoots. One of the biggest pros that reviewers found was there was zero vignetting at any aperture, which is certainly unique. The camera delivers images that are sharp at all apertures with fast, responsive, quiet autofocus. The lens also feels particularly sturdy and well-built when compared to other lenses with plastic bodies. The biggest complaints were that the camera was particularly heavy, struggled to focus in lower light and yielded more chromatic distortion than similar lenses. Overall though, the lens was reliable and performed consistently well in many conditions. Despite the high price tag, this is a good value for photographers who need a high-quality, reliable macro lens. While many macro lenses necessitate thinking about the distance from your subject to ensure you’re not blocking light or focusing on if your lens is stable enough to prevent blurring from hand shake, this lens is advanced enough that these things are not issues. At its core, the Sigma frees photographers from having to focus on the lens and allows them to think about the subject they are photographing. The lens struggles a bit in lower light, even at ISO 3200 with the aperture wide open. You may want to have a reflector or external flash in your kit for these scenarios to compensate. There are also some reviews that the lens struggles with chromatic distortion, meaning you’ll have to pay particular attention to boundaries in high contrast areas of your image. This lens is particularly strong for shooting wildlife and live subjects since it allows you to be further from your subjects and is more silent with image stabilization on than other macro lenses. Best For: Macro, portraiture and landscape photography for professional photographers. Pros: This lens sets the standard for macro photography and delivers some of the sharpest, most consistent images in the field. The first thing you’ll notice about this lens is how solidly it is built, with 13 pieces in 8 groups, including two Extra-low Dispersion (ED) glass pieces that work to reduce chromatic aberrations. Overall, photographers can take this lens into a variety of shooting environments without having to worry about dents or scratches or dust and moisture getting into the lens or the camera body where the lens mounts to the body. While this is a telephoto lens, it also has a minimum focal length of 48 centimeters, meaning you can get quite close to your subjects. The lens also has internal focusing elements, meaning the front part of the lens doesn’t extend when you are photographing a subject close up like some other lenses do. While this lens is heavy, it isn’t as heavy as the Sigma 180 since it doesn’t have optical stabilization elements. It is the most expensive and largest macro lens that Nikon offers, and sets the standard for professional quality macro images. The optics are hard to beat, and the construction is solid, with the 200 mm focal length being ideal for wild life and live subject photography. The true macro perspective and increased working distance are also indispensable for most photographers, making this lens a great option. While this lens sets the standard for macro photography, the lighter-weight, less-expensive Nikkor 105 mm lens is a great option for photographers who don’t plan on photographing live subjects. If you do plan on doing so however, this lens is an obvious choice in spite of the price tag. This lens yields images that are consistently sharp and high-quality and comes with technology that is hard to find in other shorter-length macro lenses, like a robust autofocus system and a larger working distance. If you are a professional photographer rather than an amateur or an enthusiast, this lens is hard to beat. The lens only has autofocus if mounted to a camera body that comes with a built-in AF motor, and it doesn’t include vibration reduction like some of the other lenses on this list. This is a bit of a drawback given how telephoto the lens is, as you will almost certainly have to use a tripod or monopod to achieve images that are sharply in focus. One of the best ways to compensate for this, however, is to ensure you are shooting at an ISO that is 400 or higher at a shutter speed that is 1/400 or faster. The lens is also not compatible with any Nikkor teleconverters, but may be compatible with third-party converters. As the lens is macro and not a traditional telephoto lens, however, converters are not necessary. I have the d7000. Which macro lenses are best fitted for this model? I agree with Hans and Dean, the 105mm is the best, if you’ve ever taken any macro photo, you would know that. I used a 105 mm for taking an award winning dragonfly photo, tried the 40mm but didn’t come anywhere near the 105mm. Thanks for the review. I love my Nikon 105 and especially for the huge focus ring. Big and chunky sometimes just adds stability. You seriously pick a 40mm for spot #1 and then state a small MFD as negative with the Nikon 105 mm? I have the 40mm as well, but I would give it away without much thought. The 105 you could only wrestle out of my cold cramped hands. The only thing really making me nervous is the possibility that the Tamron 90mm really creates better pics especially sharpness-wise. Someday I have to compare them for myself. I have enough time & know-how sometimes to have a chance to capture a dragonfly for a short period of time. Depth of field is better on 40 mm macro. If your flash works, you may use it on 1/16 – very useful. At that point, all that’s next is macro photographing dragonflies. Some good butterflies capture too. Yes, mostly closed wings (because I’m so close). I own a nikon d3300 – will this lens work with my camera body and let me use auto focus?